In 2000, while submitting the project, we wrote that Ukraine was one of the new states in Central and Eastern Europe that is building a new identity and a new position in Europe. School history was made a key topic in the Ukrainian process of nation building. This choice gave history also the position of the most politicised school subject. In the project we looked into this role of history education with focus on contributing to stability and democracy in Ukraine, especially regarding the different regions and ethnic and linguistic communities within the country, but also regarding the relations with the neighbouring countries. The school history textbook, History of the Epoch. The Period seen through the Eyes of an Individual. Ukraine and Europe 1900-1939, which is the result of this project, mirrors these specific elements. Such approach to history teaching puts high demands on the history educators and requires a high level of professional sophistication of those who teach. History educators therefore need professional organisations, which can act as agents of change. Independent Associations of History Educators, belonging to the EUROCLIO network, have in many countries in Europe proved to be able to act as effective initiators and multipliers of fundamental innovations in history education. NOVA DOBA, the All Ukrainian Association of Teachers of History and Social Studies had already shown similar capacities and this project therefore also focused on further strengthening this organisation. A strong NOVA DOBA would be a vital agent in the process of innovation and professionalisation of the Ukrainian history educators. To create a shared responsibility and commitment for innovations in history education in Ukraine between the authorities, teacher training institutions, and the All Ukrainian Association of Teachers of History and Social Studies NOVA DOBA. Official approval: The book received official approval by the Ministry of Education and Science of Ukraine and is allowed to be used in every Ukrainian classroom. 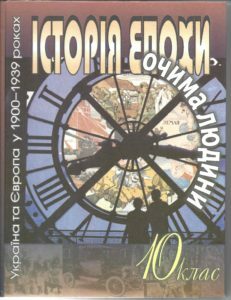 Educational nomination: The book was nominated by the publishing house Geneza as entry for the competition for the best educational and historical publication of the year 2004. Pedagogical Support through the Magazine Doba: The book is accompanied by a special edition of the magazine Doba (46 Pages). International symposium and seminar New History in a New Age: Innovative Approaches and Material on History Education organised in cooperation with the Ukrainian Ministry of Education and Sience. A strengthened Nova Doba, the All Ukrainian Association of Teachers of History and Civic Education. Magazine on the learning and teaching of history: 5 issues of the magazine on the learning and teaching of history Doba were published during the project (1500-2000 copies of each) and disseminated information, ideas, material of the project and EUROCLIO activities.